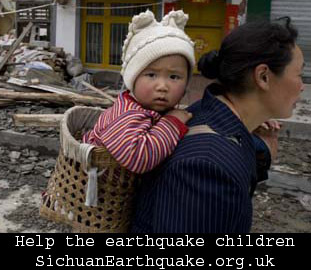 Sichuan Earthquake Update is a jointed effort by UK charity Mother’s Bridge of Love (MBL), Chinese community LinkChinese UK, Chinese Young Professionals in Edinburgh (CYPE), and other organisations to update the news of Sichuan Earthquake, the progress of the relief and rebuilding efforts viagra cost. Our focus is on the children affected by the disaster. The effect of the earthquake is terrible. The scenes of hundreds, perhaps thousands of students buried under the debris are heart-breaking. For those children who have survived, they will have a mountain to climb trying to rebuid their life. We are sending this urgent call to British public to do whatever you can to help those children cialis canada generic. 15 May 2008 CSSA-QMUL (Chinese Students and Scholars Association, Queen Mary University of London) has joined our effort. 21 May 2008 Ricefield Arts has joined our efforts and will donate all proceed of the coming exhibition Chen Qi’s Woodblock Prints to Sichuan Earthquake Appeal.